Scrooge McDuck, Richie Rich, and Uncle Pennybags from the board game Monopoly are all images employed by Alec Monopoly as symbols of corporate greed and unnecessary excess. The animated characters have become the enigmatic artist’s game pieces in his attempt to make the real life contest of economics more evenly matched. Monopoly has risen from a New York City underground graffiti artist to an internationally known craftsman. While his true identity is still a mystery, the Los Angeles based creator has elevated up through the art world to have his work appear at Art Basel Miami Beach, the Mead Carney Gallery in London, and other exhibitions. Many of Monopoly’s pieces are spirited reflections of pop culture or ruminations on the hazards of unchecked capitalism, but his biting aesthetic does not prevent him from working with the very institutions he accost in his art. Monopoly has worked with corporate entities like Paramount Pictures, Vitamin Water, and Cover Girl. He also collaborated with Madonna to recreate iconic photographs of the Queen of Pop for street art exhibits showcased around the globe. 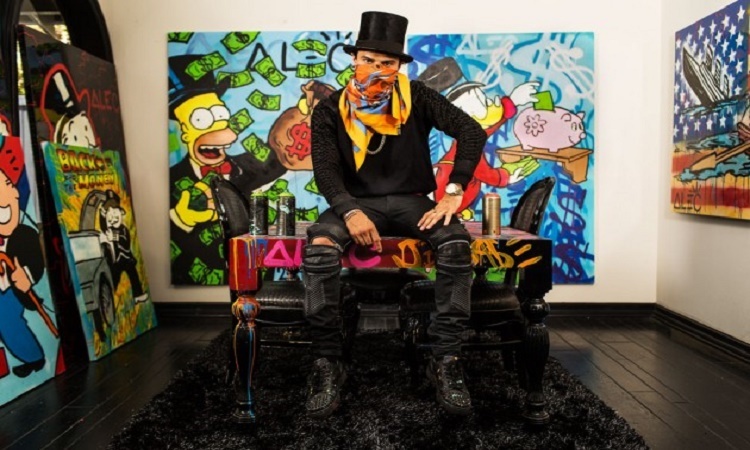 Alec Monopoly currently has 39 pieces showing at the Avant Gallery in Miami as well as four works appearing at New York City’s Guy Hepner. Even though his collection has caught the eye of high art’s gate keepers, the masked master still values the attention of the everyday worker. “The gallery atmosphere is what it is, but my true passion is doing graffiti and walls,” Monopoly told Vibe.